The Duke and Duchess of Cambridge are settling into life as a family of five after bringing their new baby son home from hospital. William and Kate have retreated to the sanctuary of Kensington Palace after introducing their third child to the world on the steps of the exclusive maternity unit, the Lindo Wing. Royals traditionally keep the public guessing before revealing their choice. William and Kate will want to share the name with the Queen and the rest of their family before making it public. Kensington Palace said the name would be announced in “due course” but the favourite at the bookies is currently Arthur, followed by James, Philip and Albert. Visitors will be expected at William and Kate’s west London residence as close family members call in to meet the Cambridges’ newest addition – a younger brother to Prince George and Princess Charlotte. The new baby prince’s great-grandmother the Queen, 92, is still at Windsor Castle for Easter Court, with the Duke of Edinburgh who is recuperating following a hip operation. Born fifth in line, the baby is the Queen and Philip’s sixth great-grandchild and Kensington Palace said the couple, along with the Prince of Wales, the Duchess of Cornwall, Prince Harry, and the Middletons, were delighted with the news of the new arrival. George and Charlotte, who visited their new sibling at St Mary’s Hospital in Paddington, London, on Monday afternoon, are likely to be at school and nursery. A confident, excited Charlotte, who turns three on May 2, turned to wave at the photographers outside the hospital as she led the way up the steps holding William’s hand. Four-year-old George, in his school uniform, appeared more wary of the huge crowds of media. 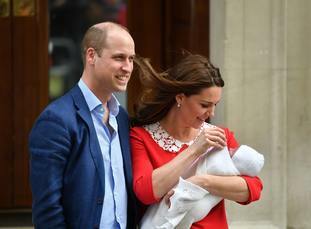 During his first photocall, the baby, who was wrapped in a white lace shawl with a matching bonnet, could be seen moving his fingers as he was cradled by Kate. Smiling broadly, the duchess was dressed in a vibrant red Jenny Packham dress with a white lace collar, reminiscent of William’s late mother Diana, Princess of Wales – who wore red and white outside the Lindo Wing after Prince Harry was born in 1984. As William and Kate headed home after appearing in front of the banks of cameras with their seven-hour-old son, the duke said they were “very happy” and “very delighted”. The duke and duchess thanked the hospital for their care and the public for their wishes. Kensington Palace said: “Their Royal Highnesses would like to thank all staff at the hospital for the care and treatment they have received. By welcoming a baby prince, William and Kate are following the birth pattern of the Queen and Philip’s children – a son, a daughter and then another son. The Queen and the duke had Prince Charles, then Princess Anne, followed by, after a gap of 10 years, Prince Andrew, with a fourth child, Prince Edward, born four years later.